Are you trying to eat healthier this year? If so, squash is a great way to go. It's lower in calories, jam-packed with nutrient's your body needs and it can be prepared a gazillion different ways. I personally prefer it baked or grilled...but my mother likes to cook it up and mash it like a potato. How do you enjoy eating squash? Today's guest post recipe is courtesy of Spork Foods. It will make 4-6 hearty servings. Slice acorn squash in half vertically, and hollow out seeds. Rub with oil and sprinkle with sea salt and pepper. Place cut side down on walled baking sheet. Roast about 30-35 minutes, or until soft. To create filling, finely dice pears and add to mixing bowl. Add roughly chopped Setton Farms Dry Roasted and Salted Pistachio Kernels, olive oil, maple syrup, vinegar, rosemary, mint, thyme, sea salt and pepper. Fold to incorporate. Scoop filling mixture into each squash half, creating mound of filling in center. Sprinkle with additional finely chopped pistachios. Place under broiler for about 3 minutes, until golden. Serve warm. 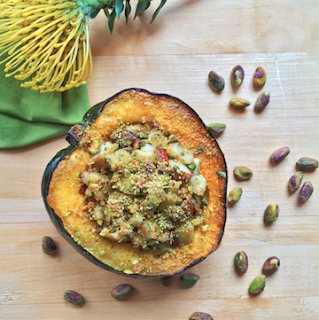 I love acorn squash and this is a new way to bake them I usually use apples and walnuts.I would love to substitute pears and pistachios for a different taste.